Microsoft has been spending quite a bit of cash on its Windows Phone 8 marketing campaign, and pulling in celebrities all along the way. There have been actors, musicians, and comedians, but now it's time to bring in an athlete as well. 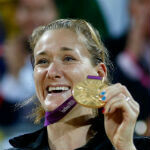 Not just any athlete, but a multiple gold medal winning athlete in Olympian Kerri Walsh Jennings. The WP8 celebrity ad campaign started with Jessica Alba and Gwen Stefani, then moved on to comedian Andy Samberg, and the newest addition to Microsoft's gallery of stars is Kerri Walsh Jennings, who is best known as half of the US Olympic women's gold medal beach volleyball team with Misty May-Treanor. Together, the two won gold medals in 2004 in Athens, 2008 in Beijing, and 2012 in London. This ad is a bit different than the past few. This one is not only longer, and goes a bit more in-depth with the Windows Phone, but it shows off some of the integration with Windows 8. That's always nice to see. its nothing but a campaign, not desperate. Ex: Google uses Michael Phelps for an advertisement; don't tell me you will call that a desperate move again? Google at least would pick the person with the most olympic medals. The top. Take your own medicine, MS is trying to shove WP8 in your face every time you turn around. Google doesn't have to do much advertising like this for the simple fact that they are a search engine and well their innovations speak for them. Windows RT and Windows 8 Pro, these guys from the outset are just splitting their own base, one side you have a newish platform with barely any support and you have the behemoth which is still stuck in the past always shoving the different look but doing the same exact things and for a pretty penny. This has been MS way of doing things for a long time, build an OS sell it and in a few years update it and make you pay for that one as well. Biggest issue is compatibility issues that arise, you would think that they would have a standardized layout, but there isn't; it's all over the place. MS needs to take their head out of the ground and build an OS that is versatile and works no matter what you toss it on. WP8 is limited to 720p resolution, right there you see them shoot themselves in the foot. Apple is worshipped by far too many well in the U.S anyway, when you can release an incremental update to a device you made 6 months ago and sell it at full price to the same customers, you are definitely being worshipped. PA fix your spell checker, worshipped is spelled correctly. Hold on a second, I don't see you complaining about the note 2, gs3, or nexus 4 having 1280x720/768 resolutions, many of you praise them as having some of the best screens. There's only one android phone with a 1080p screen released right now anyway. At 720p, the screen ppi is so high, you wouldn't notice a difference between it and 1080p, especially if that whole "retina" science is true. What needs to be the next big thing in screens is color accuracy, power consumption, and stuff like that, the resolution is kind of like megapixels, bigger doesn't necessarily mean better if they don't optimize the experience. You sir... Are absolutely RIGHT!! Difference is Google does not need Michael Phelps or anyone else in this department. Just downloading Google Maps on an iPhone helps Google. And you have fun with your cheap S3 with its 80' speedboat paint job.. I'll take my l920 any day of the week..
You like that commercial didn't you Michael H? WP and w8 is different than any other. There is no copying or rehashing. What you get is beauty and artistry that works for the individual. No WP can ever be the same as another.